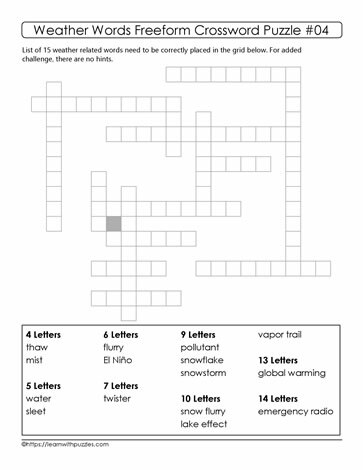 This weather freeform crossword puzzle engages the brain, supports vocabulary building skills, while helping to consolidate vocabulary building skills for students learning about weather. Suits learners in grade classrooms studying weather, climate change and global warming; home schooling environments; and resources for tutors supporting students. Solve the puzzle each of the listed words needs to be placed in the correct blank boxes in the grid. Start with either the longest word, or the shortest word to fill in the blanks. Next, find intersection points, or letters that are shared between words to complete the freeform crossword puzzle.